ProBiltSERIES Tile Spacers - Available in 1/16" - 1/2"
Measuring 1/64 - 1/4’’ (0.4 - 6.3mm), the Blue Roto-Wedge spacer allows for users to adjust to the size they need. The Roto-Wedge Spacer is the perfect spacing solution for masonry, stone, tile and more. Measuring 1/16 - 7/8’’ (1.6 - 22.2mm), the Blue Roto-Wedge spacer allows for users to adjust to the size they need. 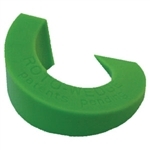 The Roto-Wedge Spacer is the perfect spacing solution for masonry, stone, tile and more. For floor tiles. Hollow structure with internal reinforcements. Supports the tensions and allows to leave into the joint and to grout over. 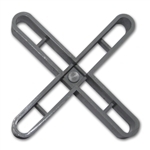 Rubi Tile Spacers - 1/16" & 1/8"
Quality base material, without impurities or imperfections. Click on image to choose size. Troxell Long Leg Tile Spacers extend further between tiles for more accurate alignment and easier removal. Available sizes: 1/8" & 3/16". The Tuscan Leveling System is an innovative product that will greatly assist most anyone in the installation of stone, ceramic, marble, granite and large format slab tiles.